Hi! I am a tiger and the biggest of all cats... and the only one with stripes. I come from Asia, but my cousins are found in Siberia too. We tigers love forests and grasslands and are never too far away from water. I love to hunt deer and wild boar, and I prefer to hunt alone. When I want to let others know where I am, I simply open my mouth and R-O-A-R!! A portion of the proceeds from the sale of this Pudgy Pals stuffed tiger helps provide housing and education for disadvantaged children, as well as protection for abandoned animals throughout the world. Fun Facts: Did you know a tiger's stripes are like a human's fingerprints? No two are exactly the same. 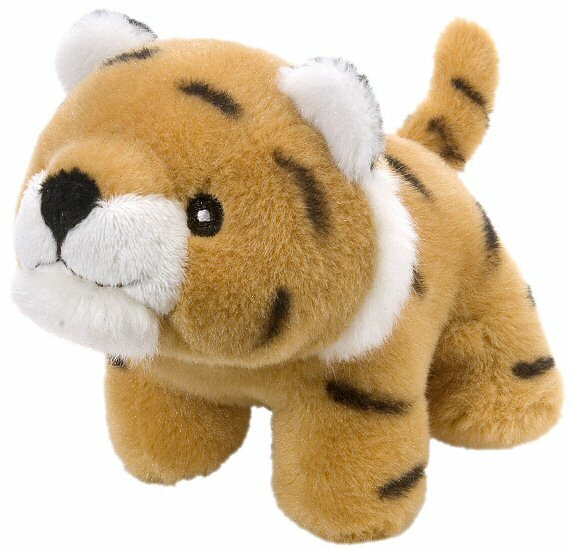 This cute little Handfuls stuffed tiger has a soft striped body, white accents, whimsical whiskers, and sweet brown eyes. Trooper is an adorable plush tiger with a cuddly body of soft striped rust fur and fun paw prints on enormous feet.